The August issue is a particularly strong one. 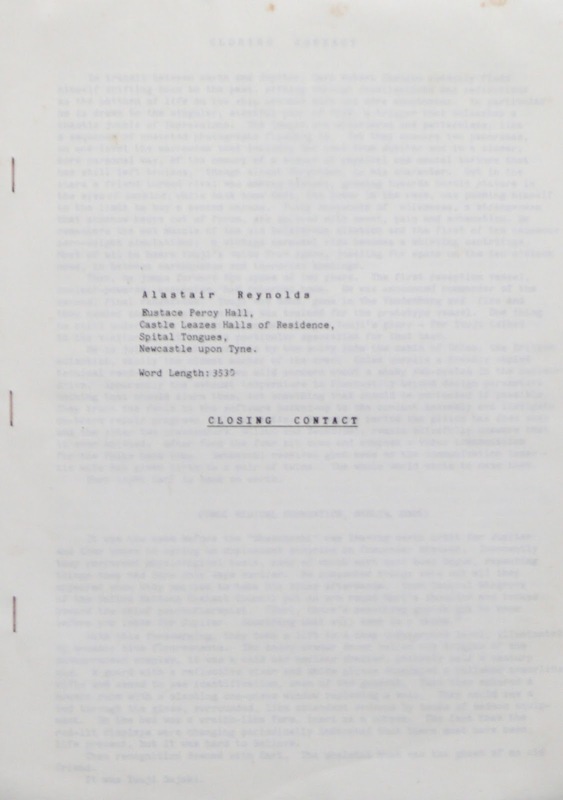 Earlier this year I lavished praise on Nick Wolven's "On The Night of The Robo-Bulls and the Zombie Dancers", and Wolven's lead piece in this issue - the equally awkwardly titled "No Placeholder For You, My Love", while shorter, is no less strong. We meet the protagonist, Claire, at a dinner party in what appears to be New Orleans, where Claire in turn meets Byron, a mysterious and attractive stranger, but before long we're being clued in that all is not what it seems: "She lifted her glass of wine to her mouth, and the liquid vanished the instant it touched her tongue." Claire, we soon realise, is - along with Byron and everyone else she meets - embedded in a kind of virtual reality simulation, an elaborate construct with a particular set of rules, and which exists to serve the emotional needs of the real people existing beyond the simulation. For the versions of Claire and Byron inside the construct, life is a joyless shuffle of romantic permutations, endless parties, endless encounters with prospective partners, with each new roll of the dice signalled by the bells of the midnight chime. To say more would be to spoil the pleasures of discovering Wolven's premise, but Claire and Byron - after being separated and thrown back together again - gradually come to a tentative understanding of the parameters of their world, and develop a plan to exploit a latent flaw in the environment. However, things don't quite go as intended. 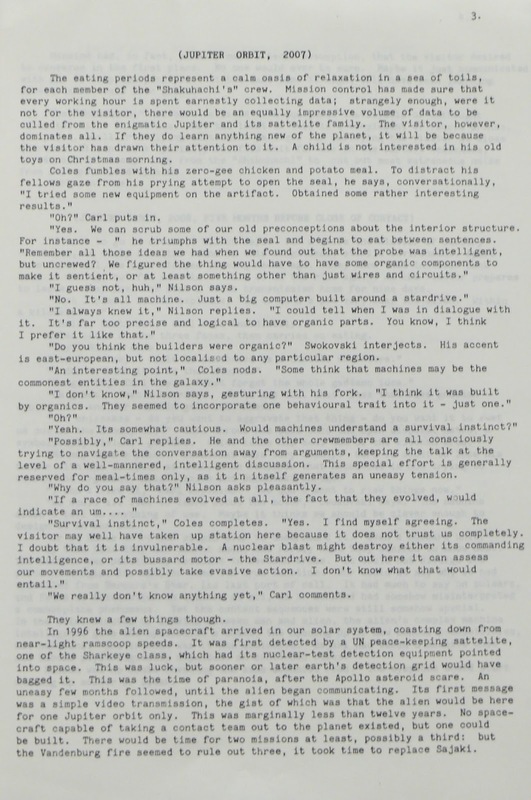 Wolven has a heady, sensuous style, displayed to good effect in both of his Asimov's stories, each of which is saturated with the heat and mystery of long sultry nights: "The breath of the bayou was in the air, warm and buoyant, holding up the clustered leaves of the pecan trees and the high, star-scattered sky." It's a story which is as much about atmosphere as the science fictional mechanics of the setting, and I enjoyed it tremendously. "Appel strudel," grunted Hermann, the four-year man in charge of the early morning guard shift. "Those pasty scientists don't know good eats. Imagine leaving strudel to sit." "Café Sluka has the best strudel in Vienna, so everyone says," Mikkel said as he passed through the security gate. "Like you'd know, moron. Wouldn't let you through the door." Mikkel ducked his head and kept his eyes on the floor. "I heated them in the microwave for you." In the interests of transparency I should probably mention that Paul McAuley is an old friend, someone whose career I've been following with admiration for more than thirty years, ever since his story "Little Ilya and Spider and Box" broke ground in Interzone by being actual honest-to-god science fiction set in the future with spaceports and interstellar travel and so on. But the fact is that better writers and critics than me have praised his work, both at novel and shorter length, and it's no real surprise that a McAuley piece delivers the goods, even if you can't ever be sure quite what you're going to get from him. If there's a common thread, it's that it's often Hard SF, but in which the speculative conceit is derived from biology, rather than the usual nuts-and-bolts defaults of physics and engineering. Not that he can't do that other stuff as well, but - as a trained botanist - his biological inventions have a rare conviction, amply demonstrated in this post-Collapse story of a woman named Mel, a "crazy old bee queen" who tends a very unusual beehive. When an outlaw gang rolls up at Mel's demanding that one of their number be treated - the bees have been genetically tweaked, so that their honey has enhanced antibiotic properties - events rapidly spiral into violence. The story is neat enough as it is, embedding some chilly insights into the biology of bees: "Some outsiders believed that because they were tweaked and networked the bees had somehow acquired sentience. They hadn't. And even if they had, it was doubtful that they would have acquired any concept of love or hate, or free will. They knew only loyalty and the chains of duty: theur life paths were engraved in their genes. The organization of the hive was as pure and pitiless as mathematics." But just when it seems to be heading toward a slightly too-pat ending, though, McAuley wrong-foots us, and the resultant conclusion offers a sharp sting in the tale. Karl Bunker is a writer new to me, but "Caisson" is an enjoyable piece saturated - fittingly enough, as it deals with workers operating underground while breathing compressed air - with a truly oppressive atmosphere. It's set in the nineteeth century, during the difficult and arduous construction of the Brooklyn Bridge, and deals with the unlikely friendship between two of the men forced to labour in the high-pressure box of the title, sinking the foundations for one of the bridge's two huge towers. When one of the men, Mischke, makes an unusual discovery during the excavations, something strange and wonderful comes into both their lives. Primarily a character piece with a keen sense of mood and place, the fantastical elements are mostly kept off-stage, which is perhaps for the best, since the underlying conceit doesn't really stand close scrutiny, at least as science fiction. But it's a satisfying story all the same, exactly the kind of thing which might have made a memorable episode of The Twilight Zone or the Outer Limits. If I say too much about Kristine Kathryn Rusch's sweet "The First Step" I'll risk breaking the story's considerable charm, but it's perhaps sufficient to say that this is both a time travel story and a piece about the personal costs that might be attendant on making the achieving of time travel one of your life goals, even if you do eventually succeed. It's a short story, told briskly, and it feels satisfyingly tight and pared down, and beyond that there isn't much to say except to say that it's an extremely likable variation on a very old theme. 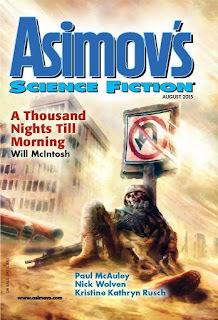 The long final novella, Will McIntosh's "A Thousand Nights till Morning", breaks little new ground in either its themes or its telling. But on its own terms, it's one of the most compulsively enjoyable science fiction stories I've read in quite some time. It's a resolutely old-fashioned account of aliens invading Earth, then being challenged by a ragtag group of human resistance fighters. What the story has in spades is a breakneck pace, as well as a cleverly and plausibly conceived foe in the alien Nunki with their total reliance on biotechnology. One minor criticism I've had of some of the stories in this year's reading is that they take a leisurely, novelistic approach to scene-setting, but no such complaint can be levelled at McIntosh. 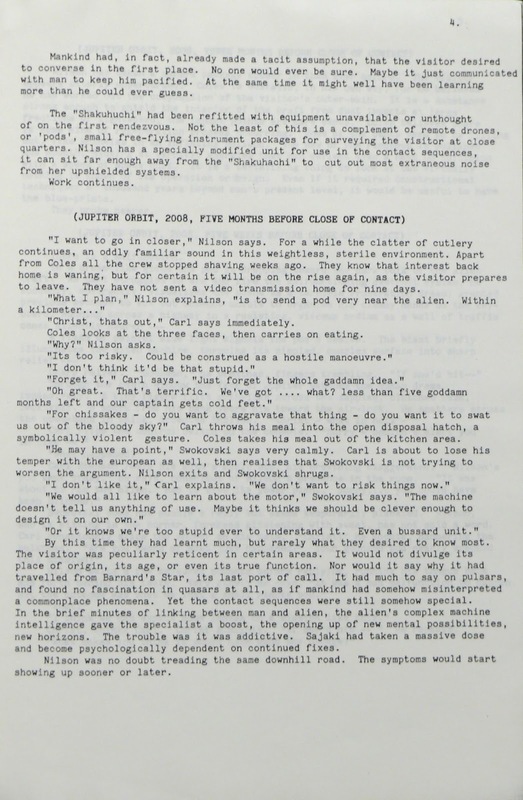 We start on Mars, with a human expedition learning that aliens have invaded Earth, and we're barely a page in before we've met the protagonist, gained some sense of him, learned about the aliens, something of their nature, and realised that the Martian expedition is now in deep trouble. Before long, the Martians improvise a desperate counterstrike against the aliens, damaging their biotechnological capability, and then send an expedition of their own back to a terribly wounded Earth. We're still only a tiny way into the story when the rocket lands back in Chicago, and if anything the story only kicks into a higher and more menacing gear when Aiden and his friends have to figure out how to help the survivors turn the tide against the Nunki. There are some neatly inventive touches here, such as the use of sign language to communicate with the Nunki, and the way in which the aliens have to learn to use human technology - guns, school buses, medical labs and so on - when their own biological systems falter. Running through the piece, though, is a strong focus on character, with Aiden having to face up to his responsibilities to an old lover, despite his deep and paralysing aversion to risk. It may seem faint praise to call a piece a real page-turner, but that's just what it is, and it takes some considerable skill to inject a sense of freshness and surprise into such well-trodden territory as the alien invasion story. As the leaves begin to drop and the warm summer nights finally give way to the chill of autumn, it's time to review ... oh, wait, it's December already, and I'm still on the July issue. Never mind, I never promised you a rose garden, so let's crack on. Mary Robinette Kowal delivers the lead novelette, "Like Native Things" and it's a nastily clever take on the idea of humans being able to jack into the nervous systems of other animals. Tilda, the scientist protagonist, is duped by bad-guy Helmut into gaining access to the experimental wetware control system of a dolphin, so that he can commit a terrorist act. The plot is simple: Tilda realises what's happened, and then has to scramble to use whatever wetware-controlled animals she can (octopus, puma and so on) to get to Hector before he achieves his aim. It's basically just an extended chase scene, conventionally - and breathlessly - told, with Tilda hopping from one animal body to another, but I hadn't seen anything quite like it before. It does all get a bit Scooby-Doo with the bad guys talking to each other in a way that very helpfully explains their plans (while Tilda overhears), but it's still fun, doesn't outstay its welcome, and I liked the ending. 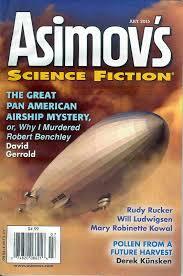 David Gerrold has been part of the field for as long as I've been alive, but having read very little of his work I was interested to see how I got on with the next novelette, which is "The Great Pan American Airship Mystery, or Why Murdered Robert Benchley." My first thought, before going into the story, was what does Gerrold have against the guy who wrote Jaws? Being thick, I didn't know anything about the "real" Robert Benchley, nor very much about the Algonquin Round Table, and to a large degree - given the centrality of the Algonquins to this alternate history confection - I can't really judge how well Gerrold hits the voices and mannerisms he's aiming for. That said, on its own terms, it's perfectly enjoyable, and along the way gets into some mildly clever metafictional games. Beyond that, I can't really say all that much, other than that if there were false notes, I was too tin-eared to pick them up. "Acres of Perhaps" by Will Ludwigsen is a likable piece that riffs off events surrounding an imaginary TV series in the vein of The Twilight Zone or The Outer Limits. On my first read, I couldn't get on with at all, but something clicked and I found it much more to my taste when I gave it a second go. With that in mind, it's worth adding that I'm perfectly aware that one or even two reads won't always be sufficient to pull the good stuff out of a story, so if I've dismissed a piece or two during these reviews, I'm more than willing to accept that it may just have been me. 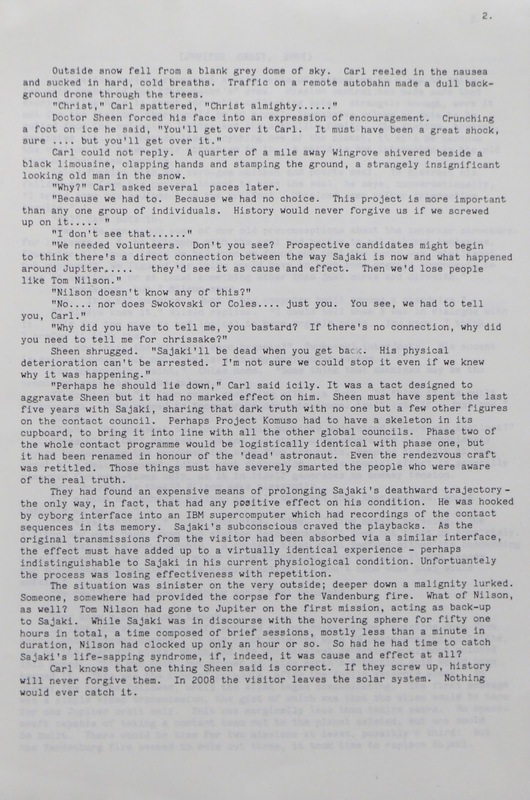 Anyway, "Acres of Perhaps" focuses on the strange background of David Findley, the resident genius on the writing team, the one who had the real creative spark, as opposed to the reliable plodder of the narrator, who can pull stories out of his hat on demand, but never quite hits the weird heights of Findley's material. What's nice about this story is that, instead of just telling us that Findley wrote weird, imaginative episodes of the show, we actually get given specific examples of what they were like. Things take a decidedly Twilight Zone-esque twist when Findley's strange, Hill-billy-type family show up on set and demand to take him home, where he'll be much happier. I liked it. "Petroglyph Man" by Rudy Rucker is another in a long line of stoned, gonzo surfer-dude Rucker pieces, this time about a new tech app called Benthos that somehow peels back reality to show what we're really thinking or feeling. If you take a photo using Benthos with your smartphone, the app distorts the eventual picture to reflect a sitation's "vibes" rather than the literal truth. Yeah. You'd better read the story, because it starts weird and then gets weirder, especially when the titular Petroglyph Man shows up. But if you like Rucker - as I do - then that's no hardship, and the story does actually have a good old romantic resolution. By far the longest piece in the issue, Derek Kunsken's "Pollen from a Future Harvest", is a dense, knotty, twisty story about political machinations on a distant planet where human scientists and military types (with a strong African background) are engaged in the study of a very alien indigenous lifeform, the so-called "vegetable intelligences". Kunsken's story centres around the existence of a natural time-gate, which allows certain forms of information to slip back by eleven years - a feature which the vegetable intelligences have incorporated into their genetic biology at a very intricate level, using gene-coded pollen which blows back through the gate and allows their past and future selves to experience a kind of continuous but ever mutating present, spanning twenty two years between its leading and trailing edges. Naturally the human investigators are very interested in using this capability to further their own political ends. Although told in quite traditional terms, it's stylish and exceedingly convincing in its imagined details, with exactly the right kind of off-hand jargon and theorizing to make the time-gate concept seem entirely plausible. I also liked the oppressive, paranoid atmosphere of the foreground narrative, with Major Okonkwo detailed to "audit" the sudden loss of pollen transmissions from the future, leading to an edgy, nervous investigation with echoes of cold-war spy thrillers. It reminded me, in the best way, of both the anthropological SF of Ian Watson and the early, icy hard SF of Gregory Benford. According to the introduction it's the second entry in a series exploring the biology of the vegetable intelligences, but while the ins-and-outs of the political gamesmanship occasionally lost me, I didn't feel that I necessarily needed to have read the earlier installment. 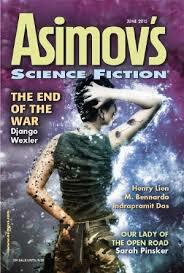 I enjoyed Kunsken's early story in Asimov's this year, but this is even better. 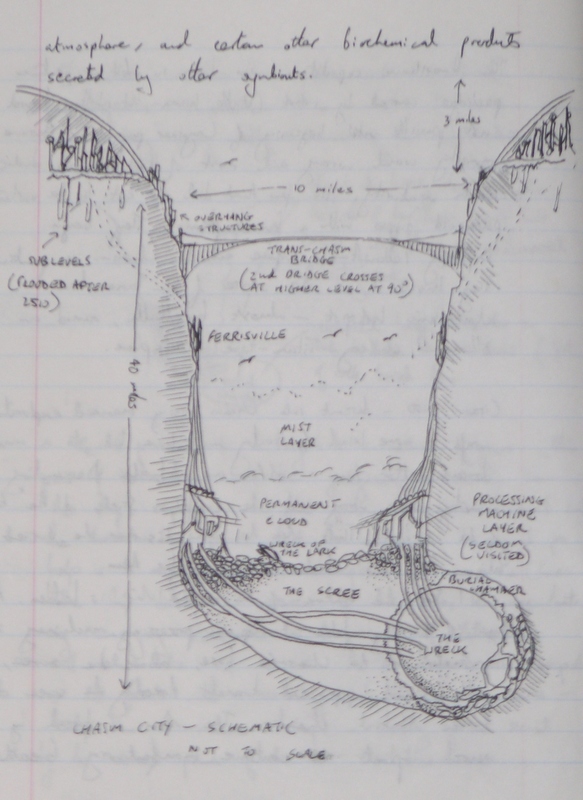 A sort-out of an old box turned up a notebook containing sketches and thoughts toward what eventually became Chasm City, my second novel. 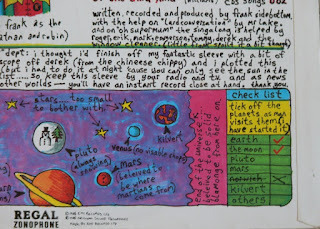 The notes were written - to the best of my knowledge - in early 1999. 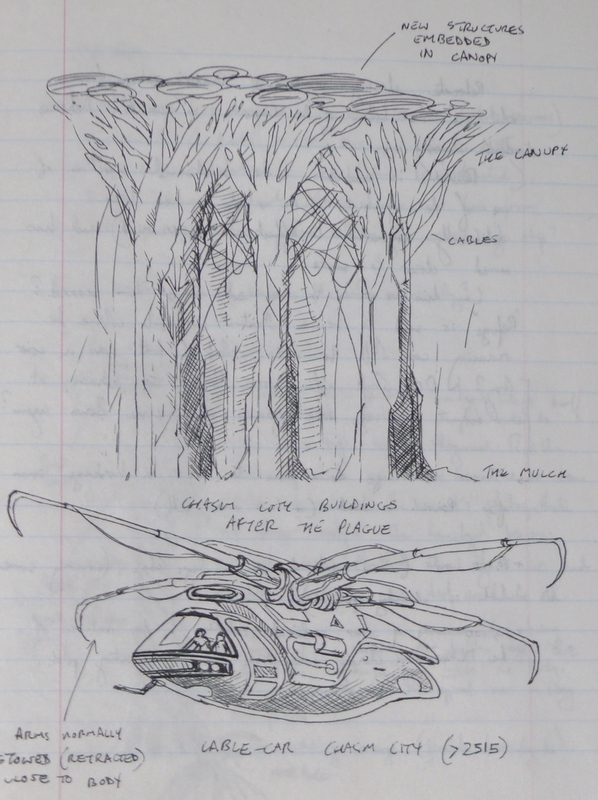 By that point I had already completed one draft of the book, but much of the sleeper ship subplot - Sky, the grubs and so on - was absent from the first version. These sketches were done as I thought my way into the more complex story that eventually figured in the final book. Personally, I loved Star Wars with every beat of my heart and still do. What's often forgotten is that, over in the UK, we didn't get the film until early in 1978. I saw it on my twelth birthday, in Swansea, and I can still recollect pretty much every detail of both the film and the drive to and from it along the M4, past the alien nightscape of Port Talbot. I remember sitting in the back of the car and hearing Kate Bush on the radio - "Wuthering Heights" had been released in January of that year, and had hit the number one spot by the time my birthday rolled around. I hadn't seen a picture of Kate Bush at that point, but - even at twelve - I was mesmerised by her voice, and in my imagination she looked exactly like Princess Leia, down to the ear-muff hairdo. I already knew about Princess Leia, though, because - even though the film hadn't come out - we'd been tormented by an incredibly long build-up. My first hint of the film had come a year earlier, I guess, when a brief clip had been played on one of the news programmes. It was a space battle scene but beyond that it didn't leave a huge mark on me. Some while later, my frend Stephen turned up with a glossy magazine, one of those Sunday supplement giveaway things, which had a colour spread about this new film that was taking America by the storm. The main picture was of an X-wing being shot at by a TIE-fighter, and I immediately knew it was the coolest thing I'd ever seen. The spaceships looked like the kinds of craft you'd seen in Space: 1999, but sleeker and even more dirtied-down. Real, basically, if such a thing were possible. And the rest of the article showed some of the characters, such as Darth Vader, Han Solo and so on. What struck me most forcibly, though, were the Stormtroopers. I didn't know what they were, except they looked like evil incarnate, with those skull-like helmets and their pristine white armour. There was something about that glossy white armour which made them about as terrifying as it was possible to imagine. I remember staring at them, trying to work out if they were robots or cyborgs or what. All I knew was that they were scary. From that point on, Star Wars had gone from something I was mildly interested in, to a burning, single-minded obsession. I had to know more. And I would. 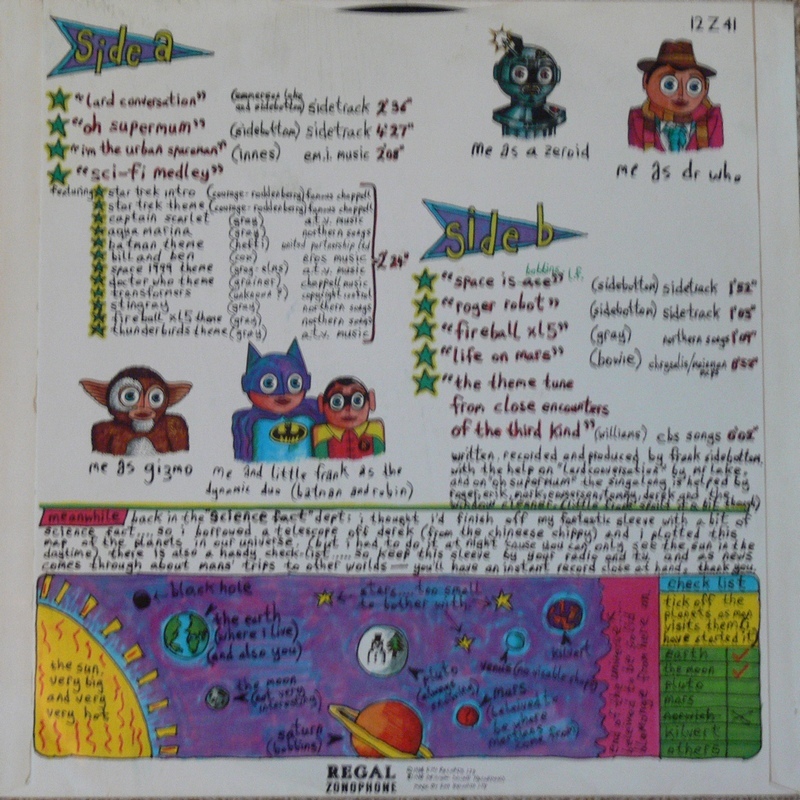 Which was only the third record I'd ever bought, after the Jaws theme and Queen's We Are The Champions. Of the film itself, there isn't much to say that hasn't been said a million times before. The ships, the speed, the colour, the spectacle - it was all bigger, louder, faster, than anything I'd seen before. One thing sticks in my mind, though. No one had prepared us for the doors! The doors on the Death Star, the Falcon etc - they closed so quickly! For some reason that had never come across in any of the TV clips and yet it seemed so important to the texture of the film, adding a real sense of menace. You didn't want to be stuck under those doors when they came rocketing down. I didn't have any Star Wars toys as such, but the day after I did what we all did in the seventies: I made it up out of Lego. I made Lego X-wings, Lego Tie-Fighters, and even arranged some boxes to create a makeshift "Trench" to send them shooting down. Later I would get more ambitious and make Lego Imperial Cruisers and even a Lego Millennium Falcon, complete with a row of white bricks at the back to simulate the exhaust glow. It was fantastic. I saw Star Wars one more time, and then that was it - the long, long wait for the sequel. I didn't stop being obsessed with Star Wars. I read "Splinter of the Mind's Eye", Alan Dean Foster's sequel, imagining - as I think did a lot of us - that this was what the next film was going to be about, and in truth found it a bit boring and bewildering. It was with some relief that hints began to surface that the next film wasn't going to be like that at all. There were huge walking machines in it, and a battle on an ice planet. Great! When "The Empire Strikes Back" came out in 1980, I went to see it, again in Swansea, once with my family and the second time on the train with a friend. I thought it was brilliant, but it left me with a strange melancholic feeling at the end. I was 14 by then, and starting to read "proper" grown-up science fiction, but I could still enjoy Star Wars perfectly well on its own terms. 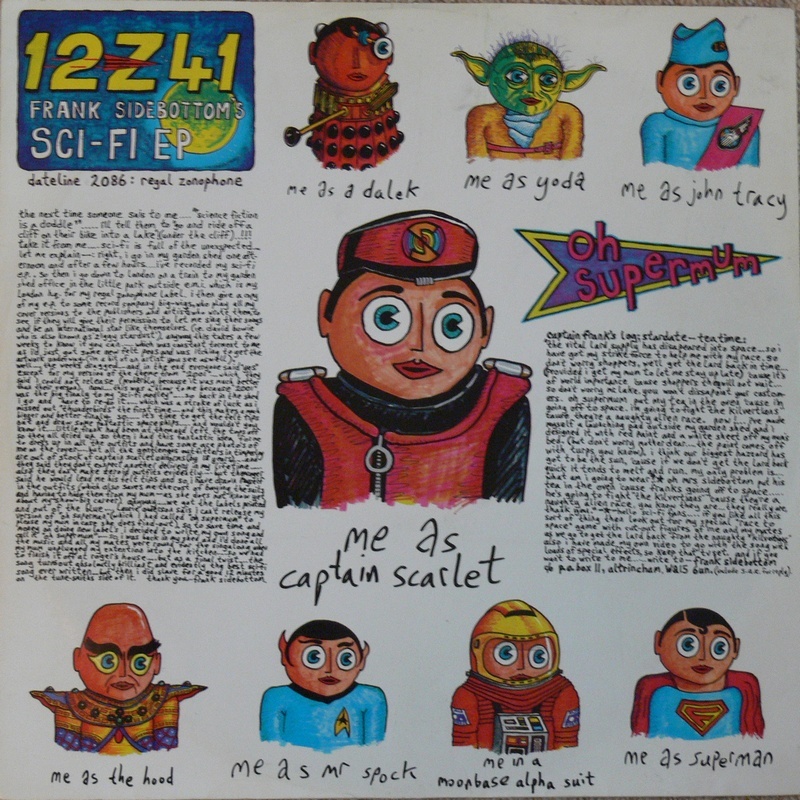 By the time the next film came out, in 1983, I was seventeen, old enough to go to pubs, trying to write my own stuff. It was a different time, and although I enjoyed the speeder bikes and space battles, the magic wasn't quite there for me any more. But I still retained a basic affection for the films and their characters, and years later, almost by an effort of will, I forced myself to find some meagre crumbs of enjoyment in the rightly derided prequels. I'm still a Star Wars fan, you see. It doesn't bother me in the slightest that Star Wars isn't really science fiction, in the sense that we usually prefer to see it. Worrying about that is like worrying about whether ice cream is pudding. It is what it is - good in parts, silly in others, occasionally great and wonderful, and in that respect my view of it isn't hasn't shifted all that radically in nearly forty years. Give me a huge spaceship cruising in from upper screen right, give me that bass rumble, give me a tiny ship trying to outrun the larger one ... and I'm sold. Oh, and I still like Kate Bush. As I alluded to in my review of the June issue, I had to set this one aside for the time being due to losing my physical copy of the magazine. 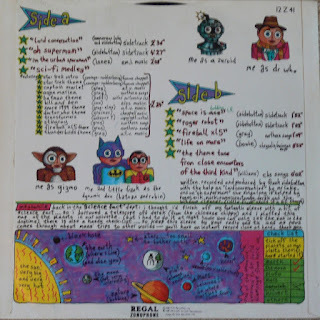 I'd been reading it during a trip to Geekopolis, the big multimedia comvention in Paris, and to the best of my recollection I must have set it down on a table during an interview and then left it there. 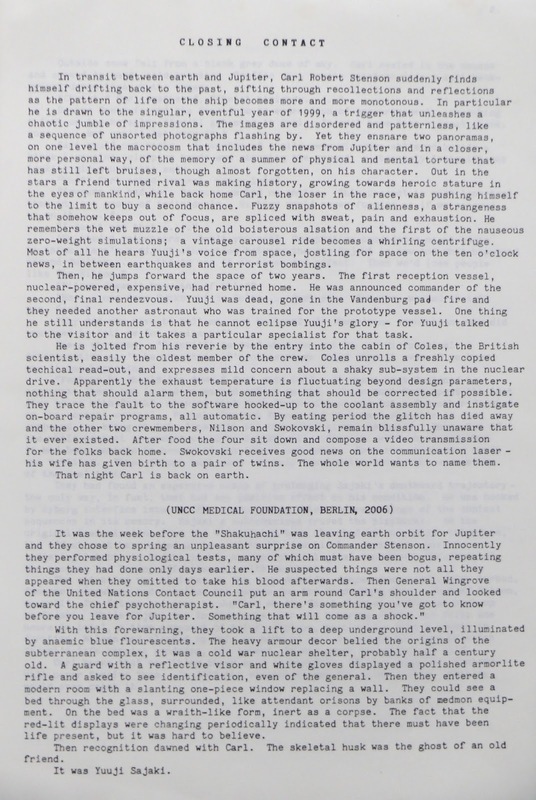 Sheila Williams, the editor of Asimov's, very kindly sent me a pdf of the edition but that brought its own complications. I could only read it on a laptop, and that meant the occasions when I normally read Asimov's - bedtime, bus rides, train rides etc - were out of the question. It took me longer to get through than normal, not helped by the double issue containing much more fiction than the usual editions. I also found - to my regret - that quite a bit of the fiction in this issue just wasn't to my taste on any level, but there were still a handful of stories I could get behind. I also decided to make a pragmatic call - if a particular story was turning into a serious struggle, I gave it two or three goes before abandoning it. 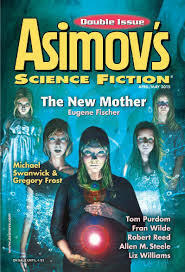 Unfortunately - for me, anyway - the lead story in this issue, "The New Mother" by Eugene Fischer, was one of those pieces I couldn't finish. I did try. It's an extremely lengthy account of the emergence of a strange new sexually transmitted pandemic that gives rise to diploid eggs, allowing for "virgin" births. It's competently told - there's nothing clumsy about it on a line by line or even page by page level - but the net result is, to my eyes, dull, diagrammatic storytelling, propped up by lengthy infodumps in the form of article excerpts. If you've ever wondered how the American medical system would respond to the kind of pandemic outlined in the story, it's probably accurate enough in its imagined details, but despite two goes I couldn't get more than a few dozen pages into it. I wasn't engaged by the journalist protagonist, her situation, her travels, the dull-but-credible dialogue. The stuff I want from short science fiction - colour, pace, weirdness, estrangement, invention, language, mood ... it's all absent here. Sorry. Onto "Day Job" by the respected veteran author Tom Purdom, whose work I've enjoyed in the past ... but not here, I'm afraid. Following on the heels of "The New Mother", it's another story which has a kind of plausible-but-dull "TV Movie of the week" feel to it. It's all very grey and uninvolving, with a pointlessly large cast of characters and viewpoints, but no real sense of place or texture. It's just dialogue, action, dialogue, action, all the way through. It's about some kind of psychological retraining scheme allowing borderline sociopaths to function in the normal workplace ... I think. But again I gave it two goes before my eyes glazed over. It's a blessed relief to turn to the Swanwick/Frost collaboration. Michael Swanwick (along with Allen Steele, who also has a story in this issue) provided a kind endorsement for my story "Slow Bullets", so feel to free to disregard my opinion, but "Lock up your Chickens..." is what I want from short science fiction, in that it's weird, colourful, different, does significant things with voice - while being incidentally laugh-out-loud funny - but it's also the kind of story that immediately offers reassurance that you're in the hands of writers who know what they're doing, who know how to sustain narrative interest, handle pace and so on. It's a kind of depression-era tale of itinerant con-men, H'ard and Andy, and I enjoyed it entirely on its own merits, completely oblivious to the fact that the characters are an affectionate take on the personalities of the real writers Howard Waldrop and Andy Duncan, something I only learned when I shared a panel with Michael Swanwick at a recent convention. It's not groundbreaking stuff, it's not going to storm the awards shortlists (I think) but it's fun and funny and technically assured. Just when things are looking up, we come to "Paul and his Son" by Joe M. McDermott, which I'm afraid I couldn't get on with at all. I read it twice, too, from beginning to end. It's all over the place. Set a decade or two from now, I'd guess, it's about a father who's come up through the era of global over-medication, and now there's a kind of backlash, in that the next generation are having to make their way into the world without being medicated ... and the story hinges on the father's efforts to track down an illegal, imported drug which he thinks will make life easier for his son. The son, incidentally, is also called Paul - a pointless, confusing complication which serves no purpose at all, other than to have the reader constantly backtracking up a line or two to see which Paul is being referred to. The narrative voice is that of the older Paul, but it's tonally inconsistent, and unfortunately quite clumsily written, with too many commas, sub-clauses and rhetorical questions. The story proceeds to an underwhelming conclusion, and I'm sorry to say it's one of the weaker pieces of short fiction I've encountered in my recent reading. My friend and one-time collaborator Liz Williams delivers a short but vivid vignette in "The Marriage of the Sea", which like much of Liz's fiction straddles the Vancean border between science fiction and fantasy, preferring to leave much unexplained. This piece deals with a sacrificial ritual that takes a wayward turn, and there's not really much more to be said other than the writing is sharp and descriptive, with Wiliam's usual control of language. I particularly liked "an air of ghastly festivity", but you'd need to read the piece to get the context. I've long enjoyed Robert Reed's work, both at novel and shorter length. He's extraordinarly prolific, and if his stories don't always light a spark, they're always delivered with a certain panache, a certain minimum level of competence, and you can be sure that they'll embed at least one or two very clever insights. "What I Intend" probably isn't classic Reed but it's reliably interesting and insightful, offering a breathtaking new take on the age-old question of SETI, the search for extraterrestrial intelligence. Reed revisits the famous "Wow" signal, then spins off from that to speculate that there might be "Wow" signals going on all the time, if only we had the capacity to detect them, and then goes a step further to come up with a genuinely original, bracing and bleak idea of What It Might All Mean. Anna Tambour's "The Gun Between The Veryush and The Cloud Mothers" starts off intriguingly enough, with a potentially evocative off-world setting involving a low-tech tribal society but with a lingering sense that there's some sort of science fictional premise lurking not too far away. But it soon shifts viewpoint (why?) and gets bogged down in interminably dull stuff involving priests and acolytes and lots of made-up names, and I'm afraid I found it impenetrably dull and earnest, and was not able to get very far into it. I don't demand that a story grab me on the first line, or even the first page, but something's got to give me a reason to keep turning the pages and simply getting to the bottom of someone else's worldbuilding, no matter how intricate or thought-through, isn't going to do it. I've said it before in earlier reviews, but I don't understand why so many writers seem intent on using multiple points of view in short fiction, even at novelette or novella length. What works in a novel works against the effectiveness of short fiction. Bloody hell, I sound harsh, don't I? "Willing Flesh" by Jay O'Connell isn't anything exceptional, but at least there's only one point of view, and the tone is perfectly suited to the material. It's a clever premise: a fat dude signs up for a dodgy weight-loss program that involves much more than he bargained for. Like all these things, it starts well, then goes off the rails. There were some odd dialogue glitches in this pieced where I found it hard to determine who was speaking, but that's a small observation. The story doesn't have a knock-out ending but it's enjoyable enough because it's not trying to do nine zilllion things at once. I enjoyed "How to Walk through Graveyards in the Post-Digital Age" by Fran Wilde rather a lot, without quite being sure I got to the bottom of it. There's some really smart, inventive stuff in this story, which blends the after-effects of post-war cybernetic surgery (involving some nasty but plausible speculation about memories being deleted or suppressed for military security reasons) with what might - just - be an actual, honest to god ghost story. I don't mind not getting everything on a first pass through a story, provided the writing gives me the assurance that there are additional levels, and in this case the piece has that necessary sheen of competence. "The Sentry" by Frank Smith also deals with the after-effects of war, but in this case the premise struck me as much less plausible. It's the twenty fifth century, supposedly, and we're out in the solar system, where the moons of Saturn, such as Tethys, have been terraformed (good luck with that, I was thinking). It's a quiet piece, in its way, dealing with a veteran of the war and his reactions to a violent but innocent event in a domestic context - the family dog mauls a rabbit - but the telling, and the details, are such that the story could easily be transplanted to 2015 with very little effort, all the more so because we're told that, despite it being the twenty fifth century, people still watch baseball and use the commonplace American slang of the present day. 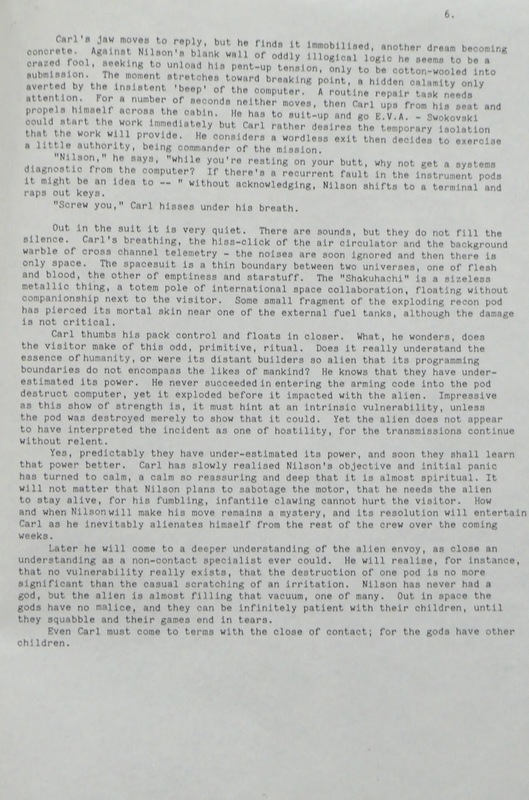 Allen M Steele's "The Children of Gal" is the long concluding piece in this issue, and it's very much in the tradition of classic SF stories such as Clarke's "Against the Fall of Night", in that we start with an insular, cut-off society that does not properly understood its origins or nature, and a protagonist breaks away from the immediate confines to get a better understanding of their place in the universe. Steele is too much of an old hand to put a foot wrong here, and from the outset we're given a reason to keep turning the pages. In its way, it starts off from a similar place to the Anna Tambour story, but Steele holds his focus on one character and gives us a reason to care about their immediate predicament. In this case, the boy's mother has been shamed and exiled after claiming - against the accepted rules of her island culture - to have seen a light moving through the sky. Of course we're intrigued, and when the mother returns from her exile - impossibly, it seems - we follow the protagonist as he comes to a richer apprehension of the nature of his world. Once the mother returns, there's surprisingly little jeopardy, and - as the protagonist meets the beings responsible for that moving light - things begin to creak a little under the weight of exposition. Oddly, I didn't much care. Perhaps it's because the story moves so smoothly, or simply that Steele's voice is so engaging, that it doesn't really matter that at least half the story simply consists of the protagonist being shown and told exciting stuff. This story, incidentally, is part a larger narrative that Steele is developing, but it reads satisfyingly enough on its own terms. So there you are - the April/May double issue. I disliked rather more of the stories than I expected to, but on the upside, there's still some good, solid stuff here and I went on to be rather more appreciative of the June issue. 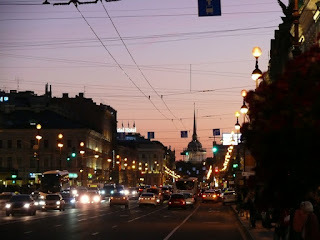 Looking down Nevsky Prospekt, St Petersburg, on a cloudless late summer evening. So I went to Russia, and it was great. 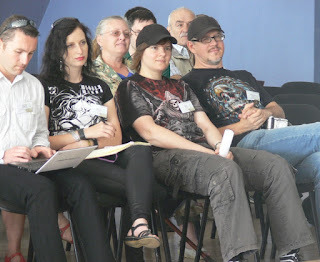 I was invited to be a guest at the Saint Petersburg Science Fiction Assembly, a small but friendly gathering of fans taking place in mid August. It came at the end of an exceptionally busy summer for me, the culmination of a year in which, at one point at least, I had been working on three novels at the same time. By August I had thinned that down to just the one novel, but I was still far from done with it and I left for Russia with considerable trepidation, aware of the work ahead of me between then and the end of September. I took a laptop and vowed to come back with ten thousand words of new material by the end of the trip. My wife travelled with me to Saint Petersburg and we were both made very welcome by the Russian fans. Nataly and Nikolay met us at the airport on a glorious sunny afternoon, and I felt immediately at ease as soon as were in their company. The gathering actually took place a long way from the city itself, but we had been told as much and it wasn't any surprise when we ended up taking a lengthy car journey into the beautiful wooded countryside, both of us seeing Russia for the first time. My wife had passed through Moscow airport on her way to Mongolia once, but I'd never set foot within the borders of Russia, despite very nearly going on a school trip to the USSR in the late 1970s. Here we were, decades later. Our venue was the "Raivola", a kind of holiday camp, with huge chalets and a very impressive central building where we ate and did all the talks and panels. 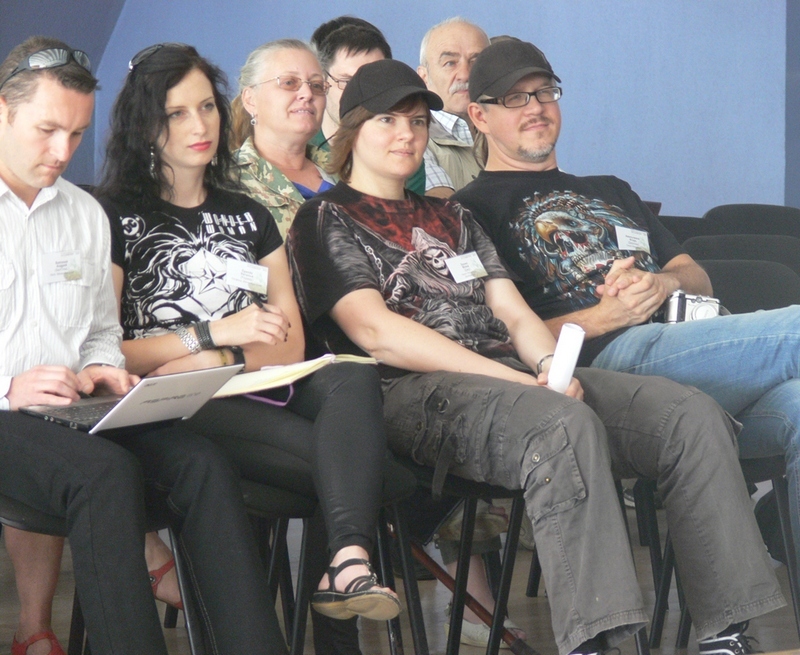 Your author ponders a particularly searching question from the audience. Look, you can tell it's Russia. The Raivola (which my brain kept insisting on translating as "ravioli") had a great buffet meal set-up which meant that we were never in any danger of starving. In fact the main problem was eating too much, and despite the many paths winding around the grounds of the camp, I only managed one rather pathetic run during the whole trip. During our meals we were always made welcome by the Russian fans and the whole atmosphere was exceedingly relaxed and convivial. 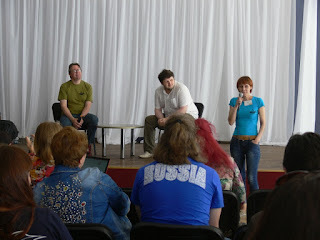 I did a few discussions and interviews, a reading (for which translated text had been made available ahead of time - a very good idea) and also sat in on one or two other discussions, not being shy of sticking my oar in when I recognised a book title or authour name amid the stream of Russian. My hosts took all this very graciously. Your author makes a shameless bid for attention with one of his shiny Russian editions. 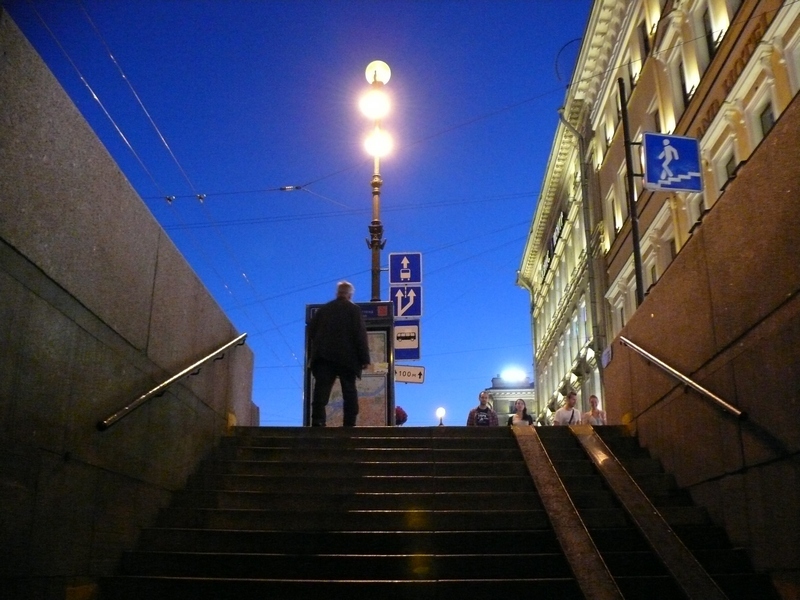 The Raivola trip had been in my thoughts for at least a year, but it was over all too soon, and before long we were on our way back to Saint Petersburg. Again we were very well taken care by our drivers Tina and (on the way back to the airport) Elena. The trip wasn't over for my wife and I, though, as we'd booked some extra days in the heart of the city, a destination we'd wanted to visit for many years, and as well as spending some extra time with Nikolay, a resident of Saint Petersburg, it was also a chance to meet my Russian editor Alexander Guzman. My wife and I are big on art, and we'd long wanted to visit the Hermitage. I can safely say that it was everything we'd hoped it would be, times about ten, and although we went back for a second day, you could cheerfully spend a month in the place and not see enough. 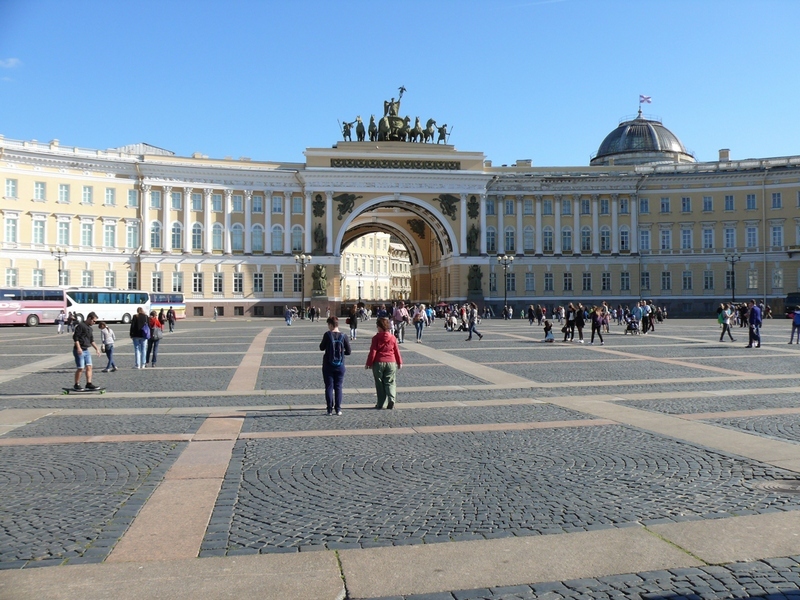 The General Staff Building is part of the Hermitage, located opposite the main museum. 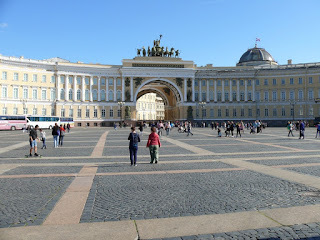 Being fans of impressionism and post-impressionism, we were particularly drawn to the General Staff Building which - internally, at least - is considerably more austere than the main part of the Hermitage, but houses a totally breathtaking collection of some of the greatest paintings in the history of art. 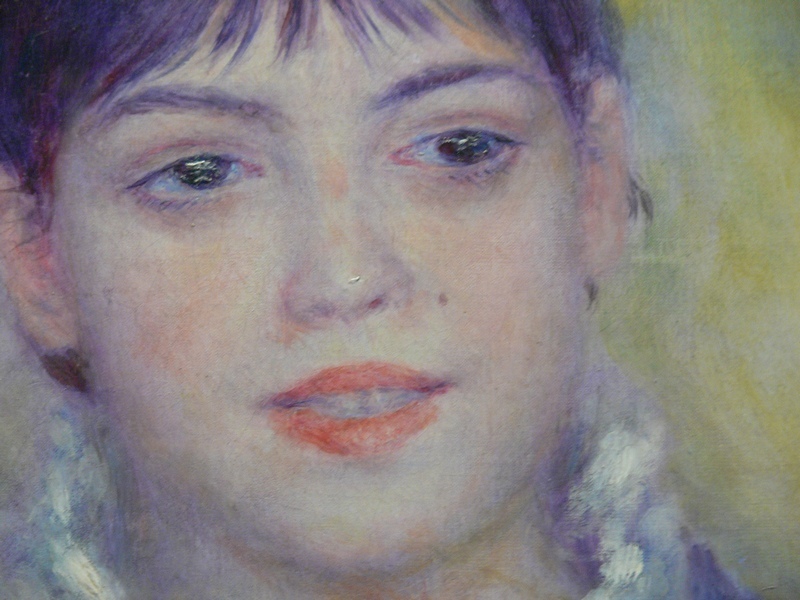 Detail of Renoir's Young Woman With Fan. 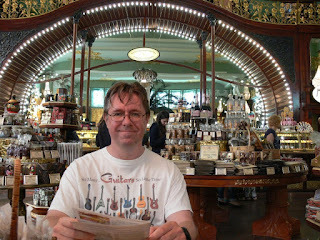 Contemplating the selection of cakes in a nicely understated establishment. Another cake. So good to look at I hardly dared start eating it. But with a massive effort of will, I succeeded. 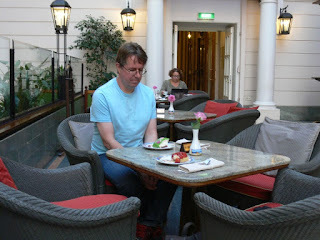 Eating and drinking was always a pleasure, and we dined out very well during our trip. Perhaps the most enjoyable meal we had in the city itself was on our first night, in a lovely, snug restaurant called "Maisha and Bear". It was brilliant. Caviar on toast to begin with (about seven pounds a head), followed by Chicken Kiev for my wife and Beef Stroganoff for me, all washed down with some rather nice local beer. Beer was also on my mind when I met the SF Assembly fans again in a British-style pub not too far from the main railway station. It was really enjoyable. My wife and I also hooked up with Nikolay again for a lovely evening, and on another evening I spent a very enjoyable few hours with Alexander, who introduced me to the editorial offices where my Russian editions are published. After that, we went on something of a pub crawl, which was great fun. Thank you to Alexander, Nikolay and all who made our stay so pleasant. 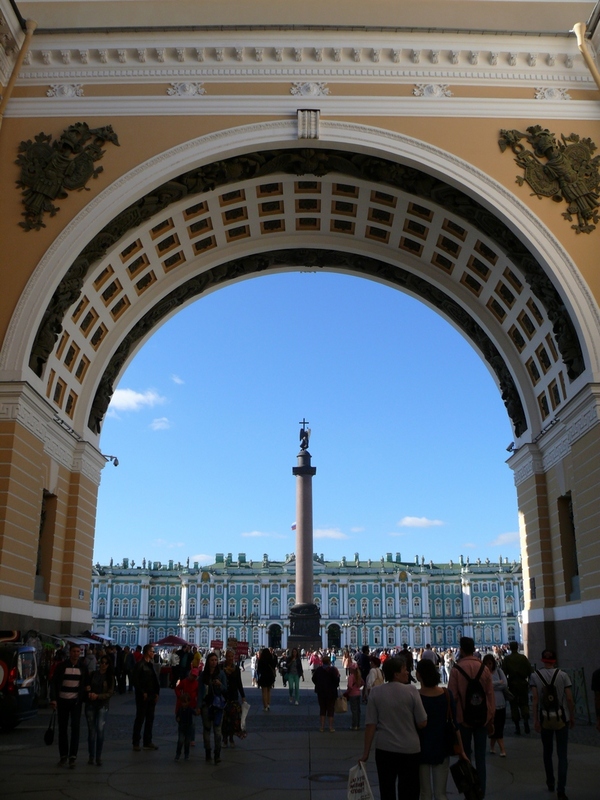 With a couple of spare hours one afternoon, we took our chances with the Saint Petersburg metro system and went to visit "Grand Maket Rossiya", supposedly one of the top tourist attractions in the city. 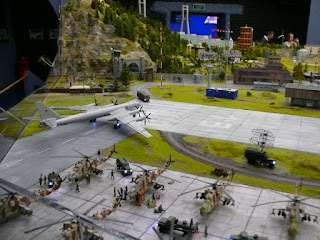 It's a huge version of Russia in miniature, with model trains and cars zipping around everywhere. 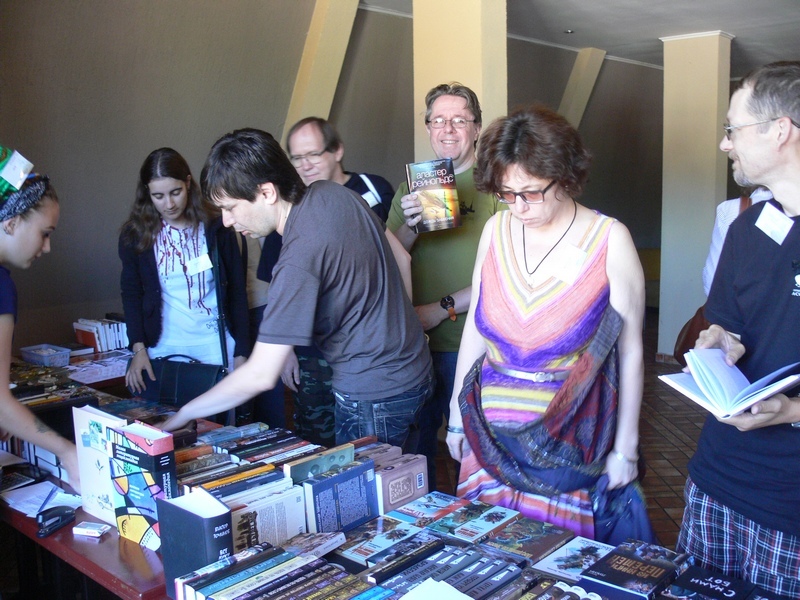 It was crowded, and seemed very popular. Unfortunately we didn't have a chance to see it all but what we managed to look at was fantastically entertaining and I could have gladly spent a day there. I've really only scratched the surface of our trip, but it was a really illuminating experience and we enjoyed every minute of it. I consider myself very fortunate to be in a position where I am invited to places like this, and treated so well. Thank you, SF Assembly, and thank you, SF fandom in general. 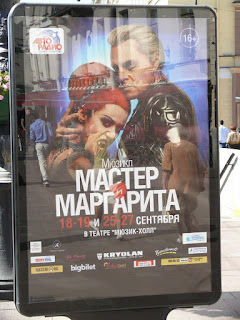 Poster for a stage version of The Master & Margarita. ps - and what about those 10,000 words I promised myself? Not a chance! 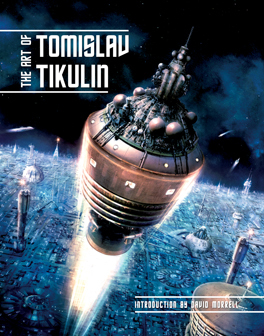 Tomislav Tikulin is a Croatian artist who has just had his first book published, by SST press. If you've been collecting some of my limited editions and chapbooks, you'll have already encountered Tomislav's fine work on the covers of Troika, Thousandth Night and so on. "It's been my great privilege to see Tomislav's artwork illustrating my stories. So much contemporary fantastic illustration is meticulously rendered, but also rather sterile and unengaging, but Tomislav's work is the exact opposite of that, with a real sense of texture and emotional depth." The hardcover book, divided into roughly two halves - SF and fantasy - is terrific, and an excellent showcase of this talented and versatile artist. If you doubt me, then I'd point you to the equally effusive endorsements by the likes of Peter Crowther, Christopher Golden, Eric Brown and Trevor Quachri. If you have any SF artbooks in your collection, this is definitely one for the shelf. Note Frank's prescient statement that it is "always snowing" on Pluto - a prediction that may turn out to be uncannily accurate in the light of recent data. What did Frank know that the rest of us didn't? 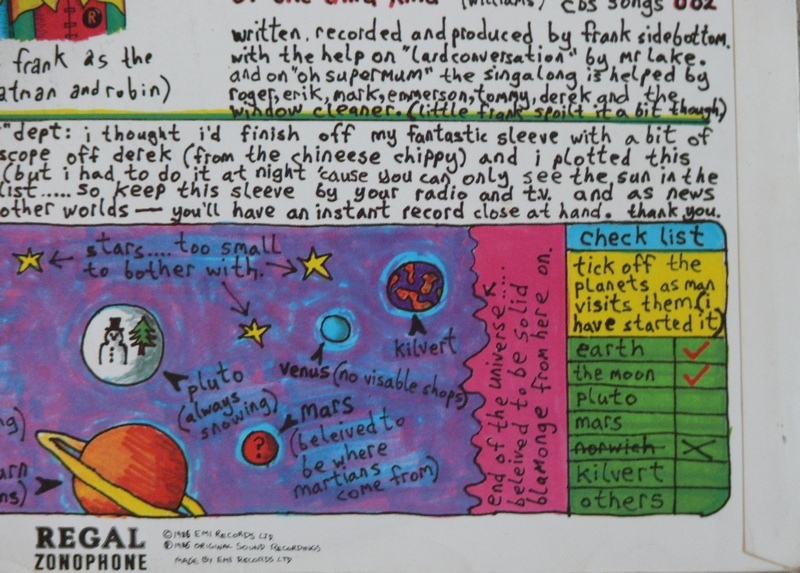 Frank was also good enough to include a handy "check list" - "tick off the planets as man visits them (I have started it)" with Norwich crossed out. As Frank said: "Keep this sleeve by your radio and TV and as news comes through about mans' trips to other worlds - you'll have an instant record close at hand." Not a great deal to report here, hence the silence. But that doesn't mean it hasn't been a busy month or so since the last update. Steve Baxter and I delivered our collaborative novel - the sequel to Arthur C Clarke's "A Meeting with Medusa" - at the start of June. At the moment we're to-ing and fro-ing between "The Medusa Chronicles" and "The Medusa Centuries" for the title, but that should be settled before too long. At various points Steve and I have used both titles, but we were always aware that we'd have to commit to one over the other at some point. We'll be working on the editorial revisions to the book over the coming month or so. At 130,000 words it's a decent sized novel, although not in the doorstopper class, and I wouldn't be surprised if the wordage drops a little as we go through the revisions. Since the Clarke story that provided the inspiration for our novel is itself not terribly long (I'm guessing it's a long novelette or a short novella, although I haven't done an exact word count) we both felt that we wanted to retain that spirit of concision and not end up writing an unwieldy blockbuster. That said, Clarke's story gave us so many avenues to explore that at times it was hard to rein ourselves in. And it's very much a sequel to the story, not - as I've seen mentioned here and there - an expansion. No; Clarke did it first and best, and Steve and I were agreed that we didn't want to touch a word of the original. What we've done, instead, is spin off from the last line of that story, imagining what happened to Howard Falcon after he came back from Jupiter. In the meantime, I'm working on my next novel, which will also appear in 2016. The collaboration is very much a bonus, which Steve and I both knew would have to be worked in around our existing contractual obligations, and it's had no bearing on the other books we're both working on. From my point of view, it's probably meant a little less short fiction being written in 2015, as well as a lot less travel, but since I had a good run last year, I don't think that's too bad a trade-off. As for the as-yet-unfinished book, I don't want to say too much about it at the moment, because there's still - as they say - a mountain to climb - and a lot could change between now and delivery. It's a standalone, though, and not related to anything else I've written, and will (I hope) turn out to be something fast-paced, colourful and not least of all fun. If that wasn't enough, I'm also turning my thoughts - very gently - to the book after this one, and that one will be a return to one of my prior universes. Which one, it's too soon to say. I'll probably have a better idea nearer the end of the year. Of course, these decisions don't take place in a vacuum. Editors, agents, marketing departments, etc, also have to think that it's a commercially sound idea, and although we've begun negotiations, so to speak, there's still a way to go before I have a definite book and title in mind. Tomorrow is the official publication day of my chapbook novella "Slow Bullets", which I'm very pleased to have published with Tachyon Press, ably assisted by my editor on the project, Marty Halpern. At just a shade under 40,000 words, it's not quite novel-length by the usual rules, but it is certainly at the long end of short fiction. But that was as far as it went; all I had was the outline, not a stab at the material, as I knew that something was missing. The second idea was also only a series of outlines. I'd become fixated on the idea of scribes, of regiments of monk-like scholars being forced to transfer information from one medium to another, by hand ... I could see them sitting in the hulk of a crashed ship, half submerged in some alien sea, trying to preserve as much knowledge as possible from the ship's dying memory. Perhaps they'd been doing this for long that they barely remembered what the ship was, or where it had come from ... all that mattered was the task of transcription. The monks had to work to the point of exhaustion, though, because on some level time was against them. But again, I couldn't go from those outlines/images to a story; I knew that the story would fail unless I found the missing element. There matters rested. One evening in early 2012 my wife and I were out for the evening - we'd gone into town to see a performance by Holiday on Ice. We got to our seats early and there wasn't much to do until the presentation started. With the lights still up, and people still filtering in from outside, my mind started wandering. That was when I realised that those two story ideas each formed the missing half of the other. I wasn't trying to write two stories, I was trying to write one ... and now the only problem was to integrate the two ideas into a single narrative. The performance started. I enjoyed it, but some part of my mind was busy beavering away on the connections between those two story ideas. One by one the pieces began to fit together. By the end of the evening, I was in no doubt that I could write the implied story. I knew it was going to be a larger piece - a novelette or maybe even a novella. But even then I didn't anticipate that it would still make me more than a year, and that the finished article would be closer to 50,000 than 40,000 words. When Marty Halpern contacted me in April 2013, asking about the possibility of a novella for Tachyon Books, it was already more than a year since I'd found a way to merge the two ideas ... and it would be the better part of a year again before Marty had the story. At one point I rewrote the entire thing without using a single comma or quotation mark... before sense prevailed. And here we are a year later again, with the book now shipping. “Alastair Reynolds’ new novella Slow Bullets has the scope of a much longer work (Edward Gibbon’s The Decline and Fall of the Roman Empires, say), the literary speed of the most rapidly hurtling bullet, and so many provocative scientific and / or philosophical ideas that even Stephen Hawking’s head might well spin with them. 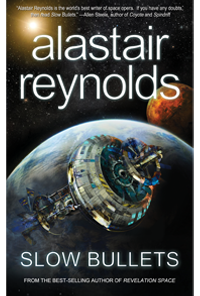 Moreover, Reynolds artfully compresses all these disparate elements into a portable trade paperback or a weightless e-file, the better to accommodate our busy reading habits and the more fully to entertain us. Thank you again to Marty, Jacob, and all at Tachyon and Tantor for making this possible. I have some questions about your work that have been bugging me for a long time. In your Poseidon's Children books, your style of writing appears to me to be markedly different from those of your short stories and the Revelation Space books; notably, that it shys away from the technical detail and minutia seen in your Revolution Space literature. I was wondering why this was, because that detail (like Skade's control of her area postrema, the many detailed descriptions of technologies, physics, and interstellar travel) are what make your work stand out to me and many other readers. 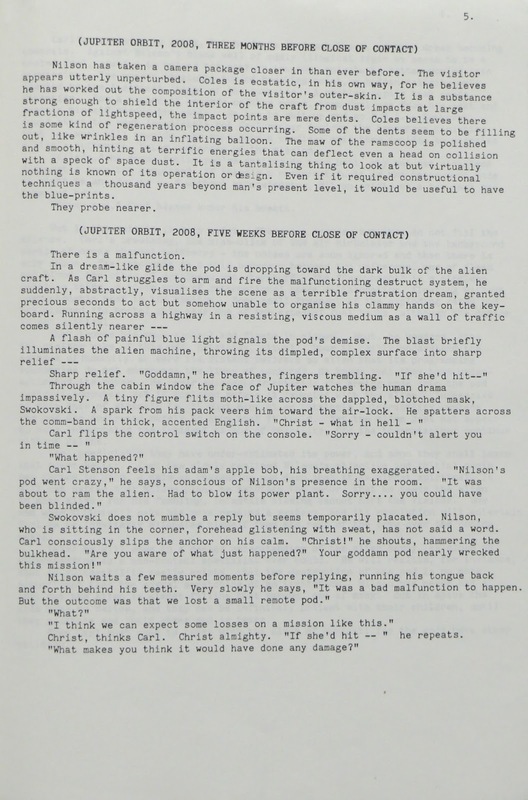 Those details and explanations are what distinguish you from your peers and what in my mind elevates your work to the status of "hard SF", something very few SF writers manage to write today. My initial reaction was one of annoyance - I don't relish the thought that I'm somehow less good at my trade now than I was some years ago. But on reflection, the email raises a fair and interesting point which I think it would be narrow minded to dismiss. I don't know how typical I am as a writer, but I can say this with some honesty: I'm riddled by self-doubt. Whenever I sit down to write, questions are circling vulture-like somewhere at the back of my mind, ready to pick over the bones of my reputation. Am I actually any good at this? Have I deserved the success that has so far come my way, or have I in some sense pulled a kind of confidence trick on the SF community, camouflaging an inherent deficiency of talent with a superficial surface of technical competence? Did the fact that I have a scientific background act as a kind of compensating function for other failures in my writing? Have editors and publishers given me a pass on the aspects of my work that are less good, because I know about stars and orbits and stuff? Some years ago the critic Franz Rottensteiner said of my work that it consists of "endless machineries that produce exactly nothing: full of sound and fury, signifying nothing." Believe me I do not dismiss such thoughts, much as I might wish to. And more than this: even allowing for the objective quality of my work, and setting aside Rottensteiner's dismissal, am I getting better or worse at what I do? And what do we mean by "better" anyway? I think about this stuff all the time. The first thing to say - and a very obvious point - is that there need be no correlation between effort and effect. In other words, just because I put X hours into work Y, there is no guarantee of achieving result Z. I can't speak for other writers, but I've sweated months - even years - over labours of love that have been met with general indifference by the world at large. I've also written pieces in a blaze of industry, sometimes over no more than a weekend, that have hit a note and continued, in their modest way, to do well. I recently got a cheque for yet another reprint of "A Spy in Europa", a story I started on a Friday evening and had finished (barring minor polishing) by Sunday, and which has done very well for itself over the ensuing 18 years. So, yes - I'm well aware that merely putting in the requisite hours is not a reliable metric of artistic success, as any unpublished writer will acknowledge. To go back to that "better" thing - what do I mean by it? My answer to that would be that because writing is a complex, multivalent activity, there can be no single metric of improvement; it's not like being a faster sprinter, a taller high-jumper. Being an excellent writer is not about being better at plotting, better at character, better at voice, being better at world-building (which I think is what our letter writer was chiefly thinking of) but rather a question of full-spectrum dominance across all those aptitudes and more. The problem - or perhaps the challenge - is that some of those metrics are in subtle tension with each other. Most writers will know this. If you think of writing as resembling a vast mixing desk with lots of sliders, pushing some of those sliders in one direction will mean that some of the other sliders can't be pushed to their full extent. There is only so much narrative space within a text. When I made a conscious decision to anchor the Poseidon's Children books around a very human clan of family members, and to eschew obvious villains and heroes, I knew that this was going to involve some sacrifices in other aspects of my writing. There's a reason we speak of the "novel of character" - it's an acknowledgment that some other aspects of novel writing will be less prominent. Similarly, when we speak of a book as being plot-driven, a "high octane thrill ride" or some such, we won't be too surprised if the text is not full of lingering, atmospheric descriptions of locales, or passages fixated on weighty introspection. Any competent writer knows that making an aesthetic decision to amplify one aspect of novel writing will lead to some readers feeling short-changed because they're inevitably getting less of the stuff they like. To those readers, the writer has indeed got worse, because their particular tastes are no longer being served as efficiently. Another group of readers may prefer the newer direction, though. To them, there's no question that the writer has improved. However, neither group of readers has a claim to anything more than a subjective position on the matter. The writer, meanwhile, might acknowledge that the new work is different in effect than the older, but they might not wished to be pressed into admitting that is either better or worse. To the writer, it might just feel like an invigorating change of mode, a holiday from what has become am effective but routine style. Writers (interesting writers, anyway) are creatively restless, and even when they hit on a set of approaches that seems to match the tastes of a given cohort of readers, they'll want to poke and prod at that envelope as much as possible - even in the full knowledge that some part of their core audience will be disappointed or indeed alienated. Your style of writing in the Poseidon's Children series is more simplistic in than your Revelation Space work in this regard (doesn't mean I'm knocking it! ), and I've been wondering why ever since I picked up Blue Remembered Earth. Is it to appeal to a wider audience? Is it your personal choice? Did people complain/not like the technical writing and explanations? I'm not sure I'd go with "simplistic" - certainly from my side of the desk it often felt as if I was juggling far more variables than at any point in the Revelation Space stuff - but I would accept that there has been a conscious intention to downplay the technical aspects of the universe. Why? Because I wanted to evoke a sense in which my characters were fully immersed in a living, breathing twenty second century - and none of them really cared how the tech worked, as long as it did. That's why there are no detailed descriptions of VASIMR drives, or telepresence systems, or implants - it's all just there, fully accepted as the furniture of day to day life. How many people know what a "universal serial bus" really is? How many people understand MP3 encoding? None of that downplaying of the technical aspects was unconsidered, and I can safely say that none of it sprung from commercial pressures, or any desire to reach a wider audience. The fact is I write solely for myself; everything else is a bonus. My publisher has given me extraordinary latitude to write exactly what I want, across thirteen novels, with next to no pressure to make my work more or less approachable to a wider audience. But to come back to that restlessness - I don't want to do the same thing over and over again. That doesn't mean I repudiate the old thing, or won't return to it. But it's just one mode and I don't want to be defined by it. But I also know that it is impossible to grow as a writer unless you are prepared to disappoint some cohort of your readership. I anticipated that I might struggle to keep up with these Asimov's reviews, and so it has proved, but nonetheless I do hope to keep doing them throughout the year, even if the lag between issue and review stretches ever further. 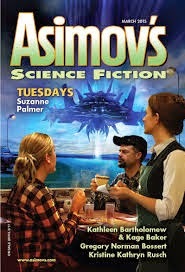 In these puppy-benighted times, it's good to return to Asimov's and be reminded that there have been, and continue to be, generations of SF writers quietly content to write the best SF they can, year after year, with no particular complaint or sense of outrage that "their" brand of SF isn't the one currently finding favour with the Hugo voters, or that they are somehow being excluded from glory by some imaginary cabal of "Social Justice Warriors". Due to an unfortunate production error, the lead story - Suzanne Palmer's "Tuesdays" - suffered from having its first page missing from the print version of the magazine. All sympathy to those involved, and thanks to editor Sheila Williams for kindly supplying me with a PDF of the whole story. This is the kind of mistake that's bound to happen when you put out a magazine month after month, for year after year, and the wonder is that something similar didn't happen decades earlier. It's worth reading the entire story, though, as "Tuesdays" is a cleverly told piece which attempts something interesting with structure, beind told through a mosaic of fractured points-of-view, skipping around in time while commenting obliquely on the events surrounding an out-of-the-way diner not too far from a certain place in New Mexico where something may or may not have happened in 1947. I've quibbled about multiple points of view in the short format before, and I will again (see my thoughts on the final story in this issue) but "Tuesdays" gets away with it because the structural decisions are fully integral to the aims of the story, not simply bolted on to make the plot work. It's a good piece with a lovely payoff, and I'll be keeping my eye out for more work by Suzanne Palmer. Kage Baker had a relatively brief SF career, spanning less than thirteen years between 1997 until her untimely death in 2010. In that time she achieved great popularity within the field, most notably for her Company stories. It takes some doing to say something new about time-travel - or at least give the impression of freshness, which is much the same thing - but Kage managed that, and the Company stories were justly celebrated. Now her sister Kathleen Bartholomew is developing further Company stories based on the notes left by Kage, as well as the many conversations they shared over forty years. "Pareidolia" is an ingenious fable about the unintended consequence of good intentions, and - fittingly, for a time travel piece - its action spans the entire period from ancient Egypt up until the sixth century, with of course hints of data and communications to and from the future. It's an enjoyable piece, with a sustained and effective use of voice, dense with period detail, and it gets into some clever territory concerning visual perception and what can be best be described as "mind viruses". The central conceit, of an image that hacks the nervous system directly, reminded me a little of David Langford's Basilisk stories, but that's only a passing similarity. If I had one lingering reservation, it would be that the story lacks a certain swerve or complication which might have been expected - it sort of proceeds smoothly from A to C via B, but it would have been nice if D had shown up. Perhaps the resolution is just a little too straightforward for the time travelling protagonist, with not enough difficulty or jeopardy involved. But that's a small complaint, and it's fine to see the legacy of Kage Baker being continued in such capable terms. Kit Reed has been publishing SF since 1958, all over the genre map, and often somewhere off the edge off it. The sheer longevity of SF careers is something to be celebrated, I think, especially when writers like Reed, in their seventh decade of publication, are still capable of coming up something as incisive and affecting as "Military Secrets". It's a parable about loss - or more precisely about the limbo of those children whose fathers go missing in war, and who therefore are denied the bitter comfort of closure that a confirmed death would offer. These children are on an endless nightmarish bus ride, trapped in a kind of driverless tube, doubting that they will ever leave - they envy those children who at least know where and when their parents were killed, and who are allowed off the bus. It's a short piece, but no less powerful for that. There's a thesis waiting to be written - not by me - on the pernicious influence of Joss Whedon on an entire generation of younger writers. With its tough-as-nails laconic space crew trading stories around a bar - some true, some lies, everyone with a human-interest backstory - I got a distinctly Whedonesque vibe from "Twelve and Tag", the novella by Gregory Norman Bossert. Perhaps it's just me, but I could easily have visualised this story as an extended episode of Firefly, or something similar. There's something about the dialogue, a certain quality of forced snappiness ... Apologies to Bossert if there is no Whedon influence, of course. Such grumbles aside, though, it's a nicely drawn piece which successfully conveys the impression of a grittily complex mid-term future, in which the outer solar system is being ruthlessly plundered for its economic worth. It doesn't really strike any new ground - Tiptree and Delany pretty much nailed this spacegrit mode forty-plus years ago, and over the last decade we've seen plenty of SF works explore the colonisation and exploitation of the solar system, but it's still enjoyably done. "One morning she sat up in bed, wide awake, as if the paling eastern sky spoke to her loud as an alarm clock." The longest piece in the issue, and the only novella, is Kristine Kathryn Rusch's "Inhuman Garbage". It's a kind of CSI-type police procedural, set on the Moon in the future, and concerning itself with Lunar politics and cloning. It's another smoothly written piece, one that never loses the reader, but at the same time I confess that I didn't find it tremendously engrossing. There's a murder, and we're introduced to a set of protagonists, and we get some sense of the wider Lunar society and its mores. But there's a matter of fact flatness to the telling, a lack of ambition in the language, a paucity of invention, that left me feeling that I was reading something that had been written without any particular investment at the level of style. "Ethan Brodeur looked at the information pouring across his screen, and let out a sigh of relief. The hardening poison wasn't one of those that could leach through the skin. He still had to test the compound to see if the poison had contaminated it, but he doubted that." This is SF prose at the default setting; it gets the job done and in any context a few lines like this are no problem at all, but a whole novella told in such flat, affectless terms becomes quite grey and uninvolving - and that's largely what we get; there is no striking imagery, no really inventive use of language, no attempt to make us see and feel what living on a Lunar colony would really be like, given that we've all read such settings many times over. It's certainly not a piece that's going to leave you reeling with future shock, the way the cyberpunks tried to cram at least one eyeball-kick into every paragraph. It's also told using the familiar structural conventions of the modern thriller novel, or indeed the modern detective TV show format, with the viewpoint shifting around as it needs to, rather than being kept tightly on one protagonist. Brodeur, the character described above, is merely a forensics specialist, rather than the main detective or the primary antagonist. Perhaps I'm too much of a purist, but (as I've mentioned in the earlier reviews) I'm always a little uneasy with viewpoint shifts within the context of short fiction, even in a longer piece like a novella. It's also worth mentioning that the telling is extremely leisurely - it takes six whole pages just to detail the initial crime and the on-scene interview. Because it's part of a larger series, too - I'm unfamiliar with the other stories and novels - we keep getting bumped out of context to be fed extraneous little asides about the functioning of the wider world and its legal and economic apparatus. Whose benefit are these info-nuggets for? Not the main characters, who are already embedded in this world. In fairness I should probably add that while I went through a phase of my life where I gobbled up police procedurals and crime thrillers like they were going out of business, I'm no longer as fascinated by the form as I once was. So an SF version of a police procedural is going to have to work really hard to hold my interest. But - on the plus side - this is unambiguously SF, of a rather hard nature - all the technical details ring true, and feel well researched - and it never wrong-foots the reader.